Results of these two models are shown in Output 93.2.1 and Output 93.2.2. 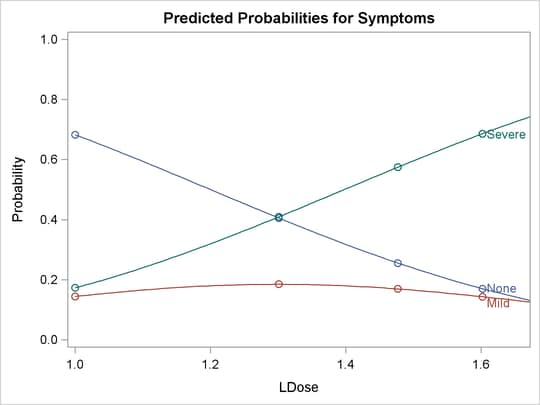 The first model allows for nonparallelism between the dose response curves for the two preparations by inclusion of an interaction between Prep and LDose. The interaction term is labeled PrepDose in the "Analysis of Parameter Estimates" table. The results of this first model indicate that the parameter for the interaction term is not significant, having a Wald chi-square of 0.73. Also, since the first model is a generalization of the second, a likelihood ratio test statistic for this same parameter can be obtained by multiplying the difference in log likelihoods between the two models by 2. The value obtained, , is 0.73. This is in close agreement with the Wald chi-square from the first model. The lack-of-fit test statistics for the two models do not indicate a problem with either fit. 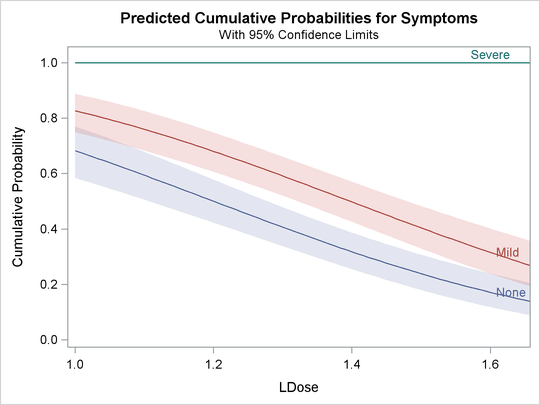 The negative coefficient associated with LDose indicates that the probability of having no symptoms (Symptoms=’None’) or no or mild symptoms (Symptoms=’None’ or Symptoms=’Mild’) decreases as LDose increases; that is, the probability of a severe symptom increases with LDose. This association is apparent for both treatment groups. 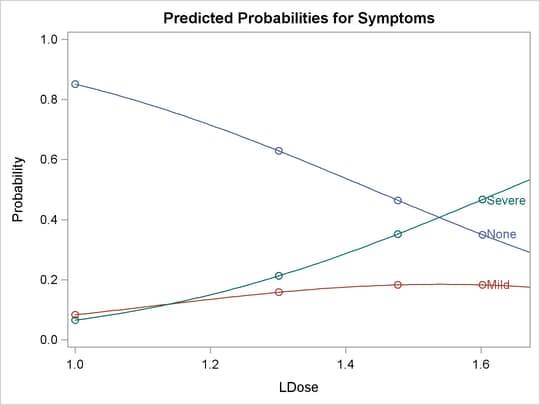 The negative coefficient associated with the standard treatment group (Prep = stand) indicates that the standard treatment is associated with more severe symptoms across all Ldose values. The following statements use the PLOTS= option to create the plot shown in Output 93.2.3 and Output 93.2.4. 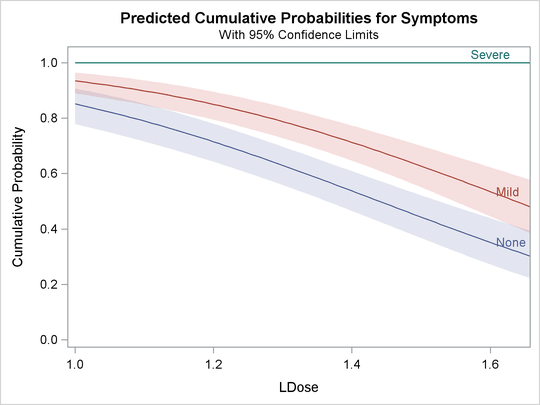 Output 93.2.3 is the plot of the probabilities of the response taking on individual levels as a function of LDose. Since there are two covariates, LDose and Prep, the value of the classification variable Prep is fixed at the highest level, test. Instead of individual response level probabilities, the CDFPLOT option creates the plot of the cumulative response probabilities with confidence limits shown in Output 93.2.4. The following statements use the XDATA= data set to create plots of predicted probabilities and cumulative probabilities with Prep set to the stand level. The resulting plots are shown in Output 93.2.5 and Output 93.2.6.